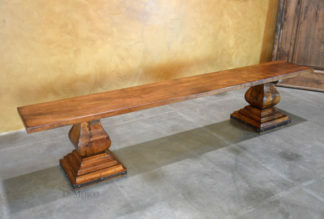 Our Spanish Benches and Sofas Catalog is made up of rustic wood benches alongside custom made sofas. From live edge mesquite backs and seats to old door benches, the pieces in this catalog beautifully show off natural grains and imperfections. Complete your living or entertainment space with a rustic bench or a full grain leather sofa, upholstered with hand dyed leather, and accented with hand carved detailing and iron accents.